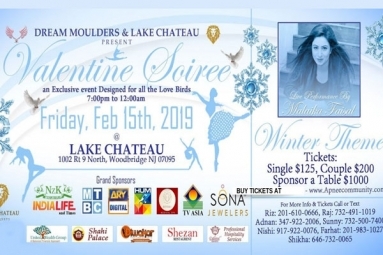 Dream Moulders Inc & Lake Chateau Presents: Valentine Soiree 2019 Brought to you by Professional Events Experts with hundreds of events experience under the belt. Program: 1. Networking Hour 2. Mesmerizing Broadway Dances.. 3. Stunning performances by our dancers will make this event unforgettable for your loved ones along with the mouthwatering food. 4. Love Bird games: Our Renowned MC will play some exciting fun games and Challenges between the couples. 5. The singing sensation Malaika Faisal will be performing Live. 6. Our Experienced DJ will rock the dance floor, Dance to the music till late 7. An amazing belly dancer will join the dance floor in late hours… 8. Premium Open Bar is available but we have rights to refuse if notice any inappropriate behavior. 9. Wear one of a kind formal dress and walk our red carpet as a celebrity. Our 10. Award-winning Photographers will take your best portraits that will be provided for your long lasting memories. 11. 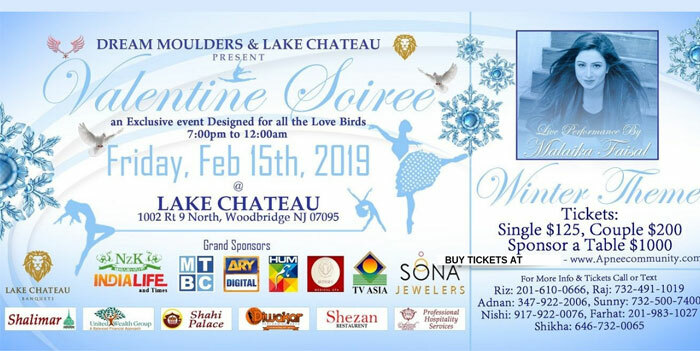 We are pleased to announce that HUM TV Network is our Media Partner for this event. For more info please call the numbers on the flyer.